Human hair has been incorporated into jewelry since at least the seventeenth century. Around that time, the hair of the dear departed began to be incorporated into memento mori pieces, as a wearable remembrance of those who had gone before. Somewhat less morbidly, hair from treasured living friends and family was worked into small pieces of art as an inlay for sentimental rings and lockets, pendants, watch fobs, anything that could be adapted to secure a precious scrap of hair. A child’s locks, those of a lover (secret or otherwise), hair from a soldier gone to war along with snips from the deceased all culminated in a flourishing business for hair jewelry in Victorian Britain. The process was reasonably priced and affordable to many and its popularity grew rapidly as treasured gifts were exchanged between friends and relatives. Remarkably, Queen Victoria and Empress Eugenie exchanged hairwork bracelets along with other gifts in August of 1855 on the Queen’s visit to Versailles. Georgian Mourning Hair Bracelet with Amethyst, c.1828. Georgian Hair & Natural Pearl Brooch c.1820’s Featuring a Coil of Hair in the Prince of Wales Feather Style. Early hairwork was transformed into wearable mementos by creating very intricate tiny designs on an artist’s palette, often referred to as “palette” work. A single curl, an elaborate design or miniature pictures could be painstakingly fashioned out of hair. The delicate results were then sealed under a crystal cap or special compartment (seen or unseen) in a brooch, ring, locket, watch fob or other jewelry or personal item. Favorite motifs used in palette designs were: Prince of Wales feathers, landscapes, basket-weave patterns, weeping willows and departing ships. The finest palette work hair brooches ever produced were made in England during the Victorian Era, circa 1840’s through 1850’s. A later type of Victorian hairwork (developed circa 1830s) referred to as “table worked hair,” involved actually weaving and working the hair like lace. A special table with a hole through the center was used to accomplish the incredibly exacting weaves and patterns. Hair was prepared, counted and weighted with bobbins, placed on the table and woven with a method similar to that which produces bobbin lace. Using this technique, the hair was transformed into springy three-dimensional coils and weaves used to create chains, bracelets, earrings, crosses, rings, etc. A variation on this style of hairwork involved a flatter, plaited style of weaving. A goldsmith would then manufacture specialized fittings enabling the hair weavings to be worn as jewels. Of special concern to the customer was that the hair returned in the special jewel was, in fact, the hair that they sent off to be worked. As the fashion grew so did the demand for hair and jewelers would sometimes advertise for hair donors. Additionally, not all hair used in these designs was human hair, occasionally coarser horse hair was substituted. The trend eventually spread to memorializing beloved pets by securing their portrait and a snip of their fur into a locket or other item. 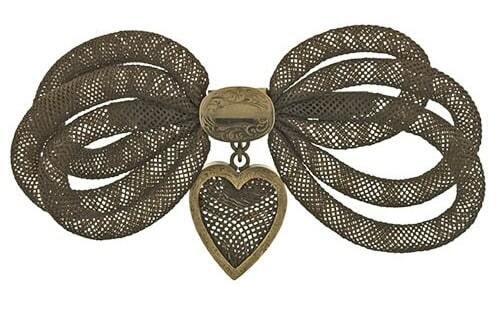 Victorian Hairwork Bow Brooch with Heart Pendant. 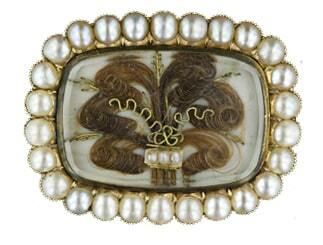 Exquisite Victorian “Palette Work” Hair Brooch Depicting a Flower. 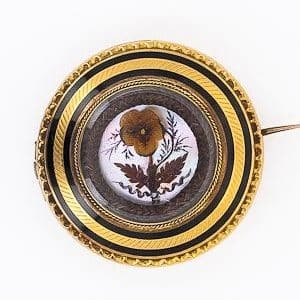 Following the untimely death of Prince Albert in 1861, Queen Victoria’s bereavement morphed the fashion from simple love tokens and mementos to more seriously dramatic mourning jewelry that incorporated the hair of a deceased loved one. In America, the Civil War was raging and the desire for a memento of a beloved soldier headed off to the uncertainty of war spurred the adoption of this fashion. Too often, these sentimental remembrances were transformed to memento mori by the cruelty of war. In December 1850, Godey’s Lady’s Book (and later and other authors) published printed instructions for preparing and weaving hair on a worktable at home. Eventually, hairwork jewelry was not only being produced by professionals but was also viewed as an appropriate pastime for Victorian ladies and gentlemen. Hairwork was as popular as crocheting or tatting by the late 1850’s. These publications enabled the passion for hairwork to flourish in America and elsewhere. In Africa bracelets and rings are made of elephant hair, these are usually black.